Christian Schad was born in Miesbach, Bavaria, the son of a distinguished and wealthy jurist. The family moved to Munich, where Schad grew up in a liberal, artistic atmosphere. His parents supported him financially until he was thirty. In 1913, Schad entered the Munich Academy and briefly studied with the well-known animal painter Heinrich von Zügel. During that time, he completed several woodcuts for the periodical Die Aktion. As a committed pacifist, Schad opposed military service and moved to Switzerland in 1915, where he stayed until 1920, participating in the Dada movement. In Zurich, Schad developed “Schadography,” a camera-free photographic process. After leaving Switzerland in 1920, he lived in Italy for five years, and then moved to Vienna, before returning to Germany in 1928. 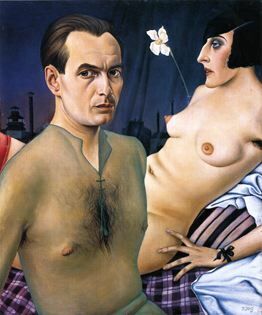 The following year, Schad participated in the Neue Sachlichkeit exhibitions in Amsterdam and Berlin. Schad began receiving private commissions in 1935, and in 1947, he was asked to copy Matthias Grünewald’s Stuppach Madonna for the city of Keilberg. In the 1970s, Schad summarized his principles: "For me, only the individual is interesting, never the social group." Indeed, he never belonged to any artists' association or mass movement, but rather searched for his inspiration among the old masters, especially Raphael. During the Nazi years, he became particularly isolated and did hardly any painting, but after the war he resumed working and exhibiting until his death in Keilberg.